MisinfoConX: Western Deep State Convenes Anti-Russian 'Astroturfing' Event? On January 31, 'MisinfoConX Scotland' will be convened in Stirling, bringing together journalists, technologists, academics and others to discuss "misinformation and 'information disorder'". The day-long "unconference" offers "lightning talks, workshops and group discussions…[exploring] the interrelated issues of trust, media/data literacy, and the threat and potential of technology". Advance media coverage has very much framed the event as a grassroots effort, connecting citizens and journalists concerned about the scourge of 'fake news' with tech experts tackling the issue. However, behind the popular facade a darker reality may lie. There are many reasons to have serious concerns about the motivations of those who are funding, promoting and supporting MisinfoConX — and question just how 'public' and 'democratic' the event truly is. The public faces of the "unconference" are Jennifer Jones and Bissie Anderson — it was learning of Jones' involvement that initially perked my interest in the event, given her controversial recent history. Hi @jennifermjones, the example you have cited in your tweet is not a bot. Lithgae is an incredibly hard working individual, a real human. They are a benefit to the Yes movement and if anything we need more people like @everywoman61. — Cameron Archibald (@MammothWhale) 29 август 2018 г. ​In August 2018, she wrote an article for Scotland's Herald Newspaper, outlining the alleged activities and characteristics of pro-Scottish independence 'bots' and 'sock puppets' on Twitter. She somewhat dubiously suggested any account with a "non-identifying profile picture" and "quote about wanting a better future for Scotland" was almost certainly "semi-automated" — and documented how she'd recently posted a thread on the social network "breaking down how to spot a bot", naming a number of accounts in the process. The response from these users to her allegations was for Jones further proof of their "semi-automated" nature. "The majority of their feed [is] made up retweets of other similar accounts…until something happens. Like being accused of being a bot. Once they realised I was looking and discussing [them], the responses were picked up by the humans behind the account. I am now in the middle my own Twitter pile-on…I imagine their anonymity allows them to use their account as a harassment tool for what [sic] I am now experiencing first hand. These types of online interactions are designed to muddy the water, and attempt to discredit an individual," she wrote. That they were perfectly authentic Twitter users simply responding to baseless, untrue accusations was apparently out of the question — and Jones evidently didn't see anything hypocritical or ironic about claiming the reactions she'd directly invited were a concerted campaign of online "harassment" intended to "discredit" her. The analysis was widely derided at the time, not least by the very accounts Jones smeared, and users who knew the individuals behind them and could confirm they were very much real people — she temporarily deactivated her Twitter account in response to the deluge of provoked criticism. Jones' resume may shed some light on how she got things so wrong — for she appears to lack any credentials relevant to digital/social media analysis or data science whatsoever. While she prefixes her name with 'Dr.' on her Twitter account and personal website — and has been referred to as such in the mainstream media — the designation is in no way technical, relating to a philosophy PhD examining "citizen journalism, media activism & media democracy" at the Vancouver 2010 Winter Olympic Games, which perplexingly took seven years to complete. Other than that somewhat abstruse doctorate, Jones' professional experience is seemingly limited to video production and web design, typically as a lecturer at various Universities. 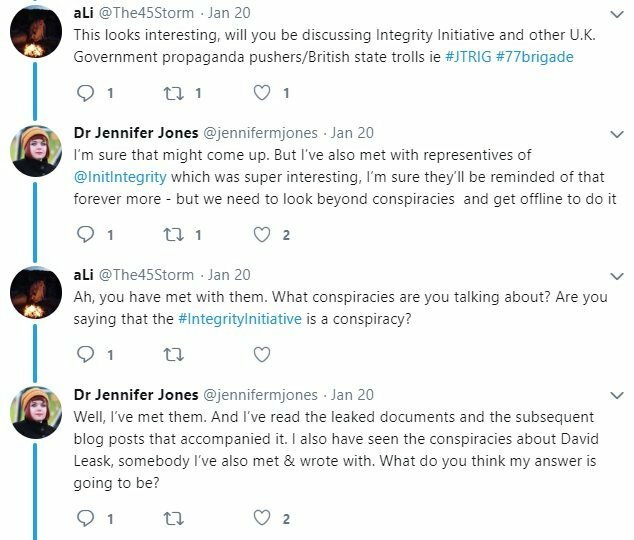 It's curious then that she met with representatives of Integrity Initiative, the shadowy and highly controversial covert military intelligence enterprise funded by the UK Ministry of Defence and Foreign Office, a consultation she describes as "super interesting". After learning of the rendezvous, I emailed Jones asking for more information on the meeting — such as how and why it came about, and what was discussed — and her professional and/or academic qualifications, but she didn't respond. Subsequent requests for clarity on Twitter merely elicited puerile ad hominem insults, and I was then blocked. Jones has nonetheless continued to attack me on the social network since — abuse that's extended to outright libel — and in one tweet stated it was "rude" to ask somebody to "justify their credentials". It's the first time I've spoken to an academic who hasn't been able to concisely outline their qualifications when asked, without hesitation, difficulty or taking offense. That Jones is seemingly unwilling and/or unable to — and indeed extremely defensive when asked basic questions — is utterly bizarre, especially given her evident keenness to highlight her doctorate. Moreover, when other users challenged her incendiary postings, she again deactivated her account. While it was reinstated a mere day later, in the mean time Jones' co-organizer and fellow long-time University staffer Anderson sprang to her defense, attacking a vast number of users — when it was pointed out her recent employment history included a spell as Digital Marketing Manager for Lockheed Martin, the world's largest defense contractor, she too deactivated her LinkedIn profile and ‘locked' her Twitter account. 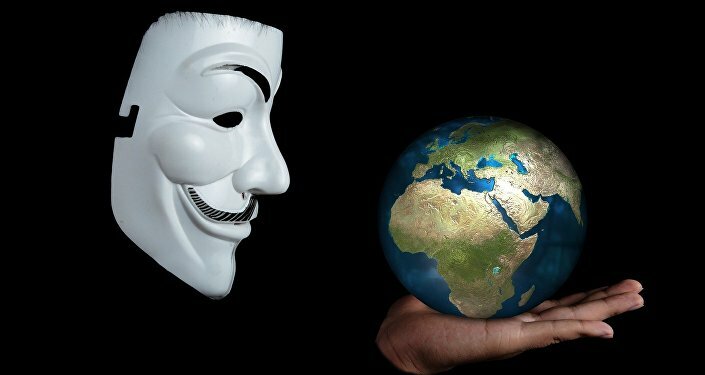 Again, these actions were undone in short order — whether their reversals reflected an understanding such suppression made them (and by extension MisinfoConX) look somewhat suspicious, or that co-organizing an event on digital and social media obliged them to have a public online presence of some kind, or otherwise, is unclear. That discussions will primarily focus on alleged Russian 'misinformation' and 'information disorder' is made clear by the event's logo, which mimics the Cyrillic alphabet, and the register of people and organizations who'll be in attendance. While a full list hasn't been released, SNP defence spokesperson Stewart McDonald will certainly be there, having repeatedly promoted the event on social media and posted grinning selfies of himself and Jones enjoying a "wee libation". He's the party's most prominent — and paranoid — Russia critic by some margin, accusing the Kremlin of exploiting the Scottish independence movement as part of its wider push to "destabilize Western institutions" — evidence for which he hasn't provided, beyond merely claiming there's a "prima facie case" for believing so. ​Moreover, in a January 23 Times article, he suggested "Russian infiltration" in the UK "isn't taken seriously by some", condemning RT and Sputnik as "malign influence", aiming to "sow division and confusion and exploit it in a malign way" — again, substantiation was unforthcoming. NewsGuard Technologies staffers will also be flying in from the US specially. The company recently made headlines for its launch of a browser extension that offers "nutrition label" ratings of over 2,000 news and information sites, informing visitors whether a particular resource is "reliable" or not via a colour-coding system running green to red. The ratings are determined by the company's team of "trained analysts" — by and large a collective of low-rank, obscure journalists who work or once worked at small-circulation, niche outlets. The resource has already caused controversy, giving high 'trust' ratings to Fox News and US government funded propaganda platform Voice of America, while significantly downranking several independent media operations — including MintPress News — on highly questionable grounds, such as being too critical of US state institutions. Moreover, it has bestowed a 'red' rating on WikiLeaks, stating the resource "fails to maintain basic standards of accuracy" — despite contradictorily conceding WikiLeaks has never published any even partially-false or incorrect information in its 13-year-long history. ​Grave concerns have also been raised about the initiative's close connections to the US national security establishment. For instance, its advisory board includes General Michael Hayden, former CIA and NSA Director, Tom Ridge, Secretary of Homeland Security under George W. Bush, Richard Stengel, Undersecretary of State for Public Diplomacy under Barack Obama, Don Baer, White House Communications Director under Bill Clinton, and Elise Jordan, speechwriter for War on Terror-era Secretary of State Condoleezza Rice. The involvement of such individuals may account for why the company — which according to Crunchbase data receives just 384 visitors to its website per month — garnered US$6 million in start-up cash from a number of investors, including Blue Haven Initiative, the venture capital fund of the Pritzker family. They've hovered near the top of Forbes' 'America's Richest Families' index since its launch in 1982, and were the second-largest funders of Hillary Clinton's 2016 presidential campaign, providing the failed candidate with over US$16 million. NewsGuard's evidently prejudiced site-labelling system is hardly unique — recent years have seen the launch of many similar 'fact-checking' initiatives, almost every one likewise the handiwork of organizations with strong links to military-industrial institutions. Sinisterly, it seems NewsGuard is going one further than its competitors though, actively endeavoring to make the resource a compulsory fixture of all smartphones, tablets, computers, search engines, internet browsers and social media apps. To achieve this end, in August 2018 NewsGuard partnered with Microsoft under the auspices of the tech giant's 'Defending Democracy' initiative — as a result, Microsoft has made the firm's ‘nutrition label' extension an enforced feature of Microsoft Edge, the company's internet browser for Apple and Android devices, and intends to do the same for Edge on all Windows 10 computers in future. NewsGuard has also reached out directly to US regional governments in order to implant the extension on school, university and library computer systems — in December 2018, Hawaii became the first state to sign up. Co-organizer Anderson seems intensely relaxed about NewsGuard's activities however, defending the organization — and its presence at the event — on Twitter, although the post has since been deleted. MisinfoConX is bankrolled by Mozilla, the corporation behind popular web browser Firefox, and an organization with deep state connections of its own. For instance, in 2018 it appointed Renee Diresta its 'Resident Fellow in Media, Misinformation and Trust' — a former Wall Street trader, she concurrently serves as Director of Research at New Knowledge, the private cyber intelligence firm founded by national security establishment veterans Ryan Fox and Jonathon Morgan. In this latter capacity, she was lead author of a controversial report for the US Senate on Russian information warfare operations, The Tactics and Tropes of the Internet Research Agency, which claimed almost everything digital, from Instagram hashtags to popular gaming app Pokemon Go, had been nefariously weaponized by the Kremlin, the US' African-American population were particularly susceptible to Russian influence, and implied US Green party politician Jill Stein was a Russian agent. If the document's headline claims didn't already stretch credibility to absolute breaking point, its probity was critically undermined when it was revealed New Knowledge took part in a highly dubious 'influence operation' to damage former state supreme court judge Roy Moore's 2017 Alabama Senate campaign. By the firm's own admission, it "orchestrated an elaborate 'false flag' operation that planted the idea Moore's campaign was amplified on social media by a Russian botnet", and sought to perpetuate sexual assault allegations against Moore to "enrage and energize Democrats" and "depress turnout" among Republicans. As documented by Grayzone Project, New Knowledge created a Facebook page aimed at appealing to conservative Alabamians, encouraging them to endorse obscure candidate Mac Watson instead of Moore. They also contacted Watson directly via the bogus page, stating they would endorse him, and asking whether he trusted anyone "to set up a super PAC that could receive funding". They also offered advice on "how to sharpen his appeal to disenchanted Republican voters", and arranged interviews for him with The Montgomery Advertiser and Washington Post. Simultaneously, Watson's Twitter following leaped from 100 to over 10,000. While many of those new followers were undoubtedly bots, perhaps created by New Knowledge itself, the firm flooded the US media with allegations that thousands of Moore's Twitter followers were Russian bots. Local paper Montgomery Observer was first to eagerly regurgitate the claims, publishing an article in October 2017 — Russian invasion? Roy Moore sees spike in Twitter followers from land of Putin - which was duly picked up by many other outlets, including Mother Jones. The organization's report — Russian Propagandists Are Pushing for Roy Moore to Win - offered no evidence to support its allegations, beyond the findings of the Hamilton 68 dashboard launched by NATO and USAID-connected 'think tank' Alliance for Securing Democracy. The dashboard, which allegedly tracks in real-time 600 Twitter social media accounts "linked to Russian influence", has been heavily criticized for not disclosing the methodology by which it determines accounts to be related to the Kremlin, or even the accounts it tracks. Amazingly though, the dashboard was in fact developed by none other than New Knowledge cofounder Jonathon Morgan — when asked what techniques Hamilton 68 employs to identify online Kremlin influence operations, his response was somewhat lacking. "We developed techniques for determining who matters in a conversation. Using some of those techniques, we've identified a subset of accounts we're very confident are core to furthering the Russian narrative in response to mainstream events," he equivocated. Claims recently made by cofounder Ryan Fox also cast serious doubt over the firm's methodology. 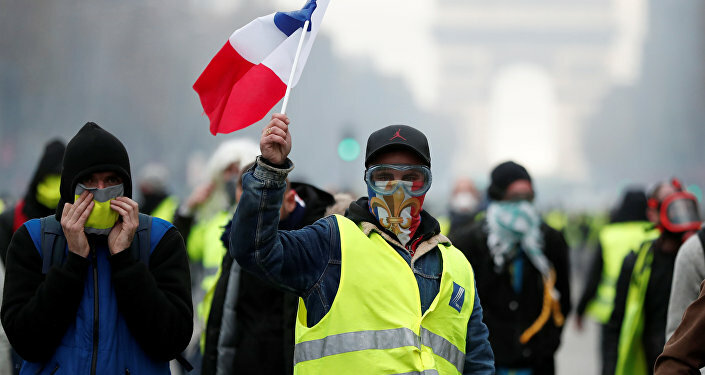 In December 2018, he repeatedly appeared in mainstream articles on France's 'Gilets Jaunes' protest movement, claiming he'd identified a vast number of prominent Kremlin-controlled social media accounts pumping out pro-Yellow Vest and anti-government content. However, he was forced to concede he couldn't offer any documentation or data to corroborate his fiery allegations, telling Wall Street Journal he merely "believes" Russia was interfering in the protests, and Wired magazine "there is no way to know for sure who is behind a particular influence network on a social media platform". Despite the obvious and clear reasons for having extreme misgivings about MisinfoConX, it would almost certainly be unfair to single out its organizers for condemnation. They are apparently not being paid for their work, and may genuinely have entirely honest concerns, and benign intentions. 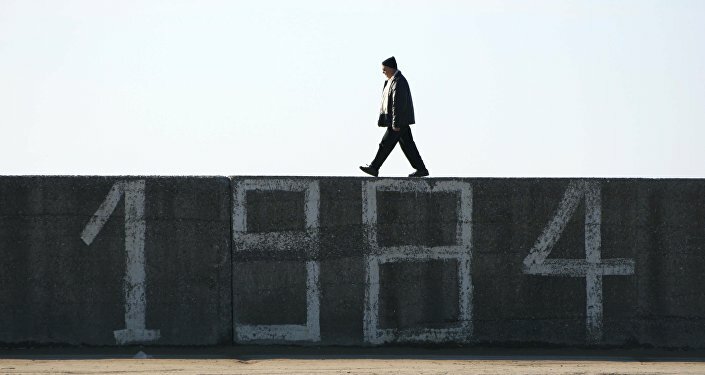 The same cannot be said of the various national security establishment-connected individuals, firms and 'think tanks' who will be offering their ‘insight' on 'fake news' and 'misinformation' online there — for they're almost certain to ignore the far greater volume of propaganda being blasted at citizens the world over by other hostile state actors far closer to home (the BBC, for instance), which have done far more damage to democracy and debate than alleged Russian bots ever could. Worryingly, MisinfoConX is potentially just one example of a wider trend, in which events discretely funded, supported, promoted and attended by — and starring — establishment-linked entities and offshoots, promulgating narratives entirely conducive to established Western power and highly disparaging of criticism thereof, are presented as 'grassroots' meetings. In this content, the event apparently selling out in just over an hour appears slightly suspect. It'll be interesting to see how MisinfoConX is subsequently reported in the mainstream media — and by which outlets and journalists. We may be seeing much more of Anderson and Jones moving forward, in articles authored by individuals connected to Integrity Initiative and other comparable 'information warfare' efforts, in which they outline politically-charged and factually dubious 'research' concocted by those very organizations under the guise of 'independent expertise'. The views expressed in this article are solely those of the contributor and do not necessarily reflect the official position of Sputnik.